The Lib Dem leader is from a different tradition to the two that have dominated post-war politics in Britain. He is neither a Tory (whether toff or arrivist) nor a Labour machine man. He is a new breed, a Euro-mandarin, smooth, modern and from beyond democracy. As Nick Clegg starts to distance himself from his Coalition partners in preparation for next year's election and positions the Lib Dems for government with Labour I thought I'd re-visit this post I published on 28 January 2013. It is important to try and understand Nick Clegg rather then join the hate campaign against him. For three reasons. First, the campaign is driven by Labour scapegoating, to displace onto him and the Lib Dems responsibility for the way they themselves screwed up; second, because it also displaces attention from the Prime Minister who is the prime mover and architect of government policy and uses Clegg as a heat shield; and finally because Nick Clegg is not a cynical, wicked politician. In fact his problem may be that he does not know how to be a politician at all in the way we are used to. I was struck with how apolitical he is when I saw him give the Hugo Young lecture in the autumn. In the question session afterwards I put it to him that what he called democratisation was in fact marketisation, especially of the NHS and the education system. You can read the exchange here. It was clear to me that he simply did not really understand the question, at least not in the way a political operator would. A very senior Lib Dem supporter of Clegg in the House of Lords told me afterwards they agreed, he did not grasp the point at issue, namely democracy as we know it. Since then I have been trying to work out what kind of political animal Clegg is. He is not a traditional liberal or even a Whig, deeply embedded in one of the honourable traditions of British politics. Obviously he is not a machine politician of the kind produced by the Labour movement, many of whom have a great 'feel' for the texture of politics. Vince Cable, by contrast, has come from this tradition as has Shirley Williams, both were Social Democrats before joining the Liberals. But nor is he a Tory, even though his wealth and schooling would might seem to fit him for the Conservative Party. Instead, he is something new in Westminster politics, he is a Eurocrat - an unfamiliar public figure this side of the Channel. His first real job was in the European Commission. He then had five years as a member of the European parliament. More important, he is by background and culture part of the Euro elite. The top administration in Brussels was full of vons and vans, I’m told; meaning members of the European aristocracy who have often been humiliated by the continent’s history while supporting each other as best they can. Clegg’s parents own a chateau in France (helpfully photographed in a Daily Mail portrait) and a 20-room skiing chalet in Switzerland. 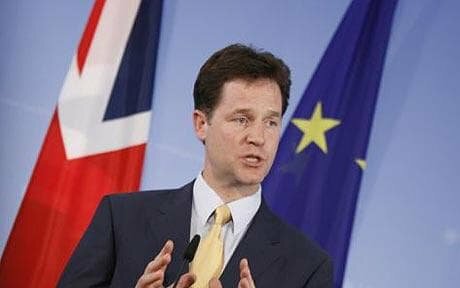 Clegg’s grandmother was a Russian aristocrat, his mother part of a elite Dutch family, his father is a financier, his wife a Spanish lawyer. He is fluent in the major European languages as he moves from one country to another. On an early trip to Berlin with the Foreign Secretary, Hague looked on uncomfortably as Clegg spoke German to his hosts at their joint press conference. From a European point of view, Clegg is from a far more elite and wealthier background than Cameron. But he is not a Tory because of their frankly parochial, backward attitude towards Europe - its power, influence and culture. If I’m right in this, it means that Clegg’s instincts are those of our rulers in Brussels. These instincts are frankly lacking in democracy, which they regard as the petty necessity of local government otherwise known as nation states. They see their role as enhancing the power and rationality of the EU, making it a global player while defending and protecting Europe’s culture and way of life as a whole. All the closures, impediments, borders, particularistic regulations, need to be swept away - or removed by stealth. Ever closer union is the presumption, however long it takes. Nations in particular are regarded as tiresome grit in the wheels. France and Holland say ‘No’ in a referendum on the new constitution, well then let's re-categorise it as a Treaty and proceed. Ireland votes ‘no’ to the new version? Give it a year and an arm twist and it will change its mind. Public pledges are obstacles to work around. Things you need to say in order to get to where you can take the action that will take things forward. You can't be held back by them! The larger project is to put nations in their place. Then, as Europe works and delivers, so the populace will drag along behind convinced, by its higher standards and its achievements. If you look at Clegg’s pledge about student fees in this spirit you can see he regarded it as simply what was necessary to get as many Lib Dem MPs elected as possible. Once elected another logic begins. Breaking the pledge then becomes the next best administrative step: one that is as necessary as having to make it in the first place. The idea that pledges or referendum results should actually decide things is impractical if not absurd. you cannot be a liberal without being an optimist. And it is my unquenchable conviction that if we place our faith in people rather than in institutions, our future, and the future of new progressive politics, is bright. Just think about this for a moment. What is the politics of a country if not its institutions? But Clegg places no faith in ours at all, not even in combination with the people whom he contrasts to them. He is saying he does not place his faith in mere institutions, such as: parliament, the courts, the monarchy, local government, the armed forces, the BBC, the NHS, schools, or universities. None - you can make your own list of institutions discarded by his peroration - will give out brightness to light the future. All that there is, is “faith in people”, stripped of the vehicles that make democracy possible. Of course this opens the door to marketisation. But not in a vulgar way, you understand. It is the product of a highly civilised, multilingual, sophisticated culture that believes in Europe. And the liberals among them do believe in the European people. But they don’t believe in their nation states, the ultimate ‘institution’ of them all – and the home of politics. Clegg is not therefore a cynical Whitehall mandarin turned elected politician. He is not like a Tory nationalist obsessed with British greatness who shudders at the Human Rights Act. He is a modern man full of confidence, impatient to lift the country to what is for him a manifestly superior level. Let’s stop the talk and get on with the job, is his view. I suspect he believes he is recruiting Cameron to it and if Cameron fails the test he will set about recruiting Ed Miliband to it.